Beards are booming these days, whether short or long, meticulously styled or scruffy, among young college hipsters and mature, graying CEOs. With the rise of the beard, there has been an increase in products that help beardsmen manage them. Among the many tools now out there, there is perhaps none more practical than the beard bib. 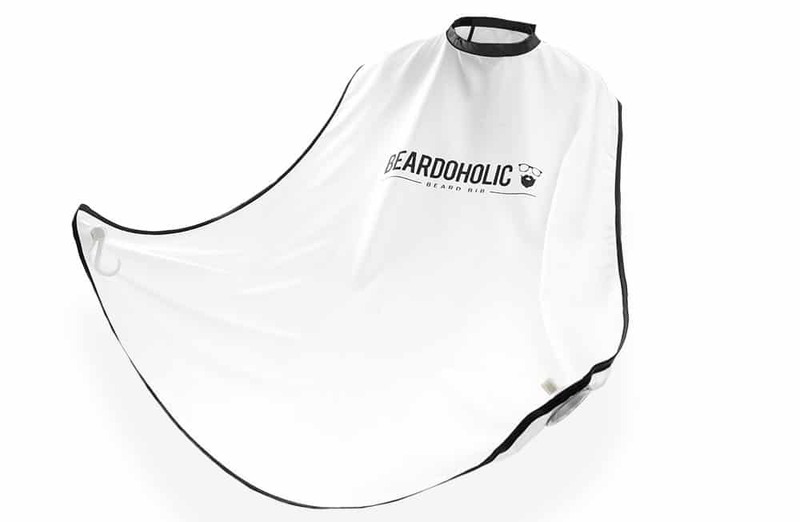 What is a Beard Bib (aka Beard Cape, Beard Apron)? A beard bib is exactly what it sounds like. It is a large piece of cloth (think of what they make you wear at the barber shop) that wraps around your neck on one end, and has suction cups on the other to stick to your mirror or tiled bathroom wall. Its purpose: to catch all the prickly, messy hairs that cascade from your face while shaving. Once you’ve finished, you unstick the suction cups, fold the cloth in half, and tilt it downwards into a trash can for the easiest post-shave cleanup of your life. Do I Really Need a Beard Trimming Catcher? If you have a significant other, if you have a cloggable sink or shower drain, if you hate sweeping and wiping and still having hairs clinging to the floor and counter top, or if you hate feeling those prickly shaved hairs all over you, then you already know the answer to this: YES! How many times has your partner had to ask (aka – nag) you about the hair in the sink and on the floor because you forgot or didn’t have the time to do it when you shaved? How many bottles of Draino has your sink and/or shower drain had to drink this year to unclog it from the mass of hair stuck in it from your shaving? 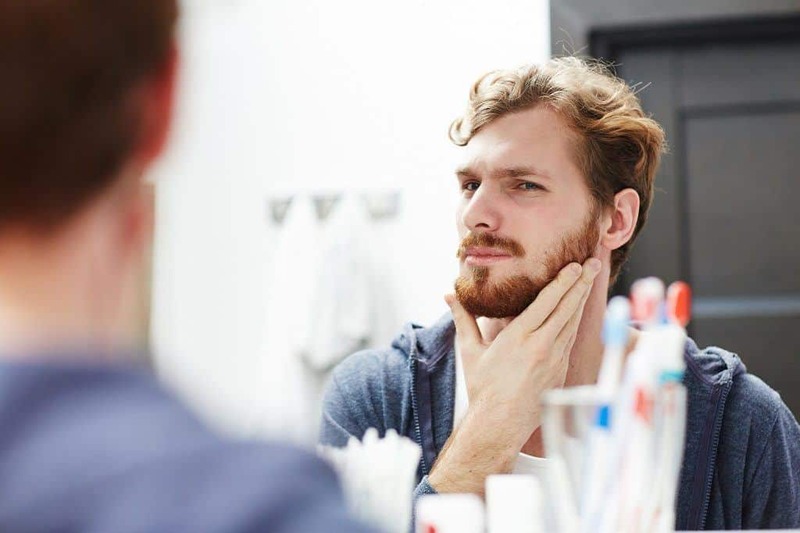 Even if you have a short, trimmed beard, it doesn’t take but a few shaves before the drain starts to get backed up. And if you like a clean bathroom, or if you like having company over, how many times and ways have you had to try to sweep up, wipe up, and mop up those tiny hairs that want to stick to everything! A beard bib (also known as a beard apron or shave bib) helps solve these dilemmas. The beard bib is one of the most practical and widely impacting tools you can get and really, there is no reason for any beardsman not to have one as part of their beard grooming kit, regardless of how short or long your beard might be. There are an insane number of grooming kits out there, so check out our previous article on How to Choose the Best Beard Grooming Kit! Voila, you’re done. No mess to clean up and you are ready to walk out the door! As long as you have your tools set up within reach before strapping in, you should be good to go. Some bibs even have their own tool pouch so you can have everything you need super handy. While using your handy dandy beard bib, there are some basic steps to trimming and styling your facial hair that you should remember. 1. 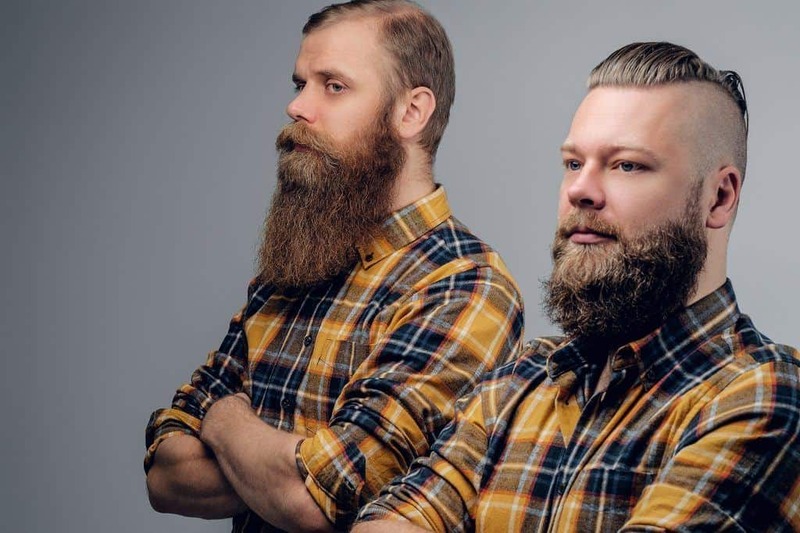 Determine/know your beard style: the style you are aiming for will determine how long you need to let it grow and where the neck and cheek lines need to be. 2. Wash and pat dry your beard. 3. Comb your beard, including mustache portion (if applicable) and your neckline; make sure you comb in a single direction. 4. 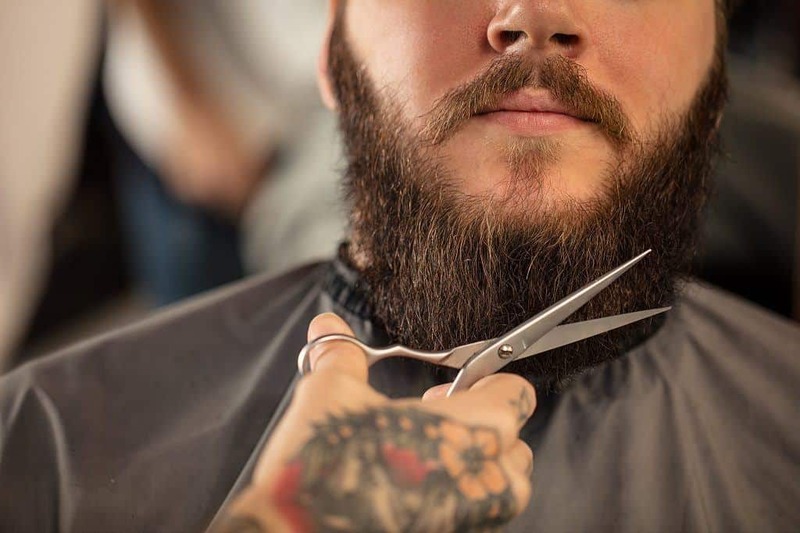 Using clippers, trim your beard to slightly longer than the desired length. 5. Using a smaller setting, start working on the beard fade as you move toward the neck and cheeks. 6. For the mustache portion, make comb all the hairs to the side and clip on the desired setting for length. Then comb the mustache down over the lip, remove the clipper guard, and trim all the hairs that hang over your lip and into your mouth. 7. Use beard scissors for detailing and getting rid of those stray hairs. At this point, if you are wanting to work on shaping your beard and not just trimming it, you would want to grab your beard shaping tool (make sure you have it close at hand while using your beard bib) and sharpen those lines. The beard bib, while fairly new on the scene of beard care, is an enormously useful tool for any beardsman in your life, making it the perfect gift for any of the bearded men you know and love. The beard bib saves on clean up time and keeps the shaving area spotless (that in and of itself would make anyone thank you). Additionally, it saves on cash, since draino and emergency calls to the plumber won’t be as frequent. You would also be helping to heighten the level of peace in the home for whoever you gifted one to, since there will no longer be messy, stubborn hairs sticking all over the bathroom sink and floors. Of course, there are a variety of beard bibs on the market to choose from now, so you will want to do your research to see which one will be the best fit for you or the beardsman in your life. This is my 2nd order of this bib product. This one is a gift, what more to say than I love it! After using it, my wife loves me even more. Happy wife, happy life!